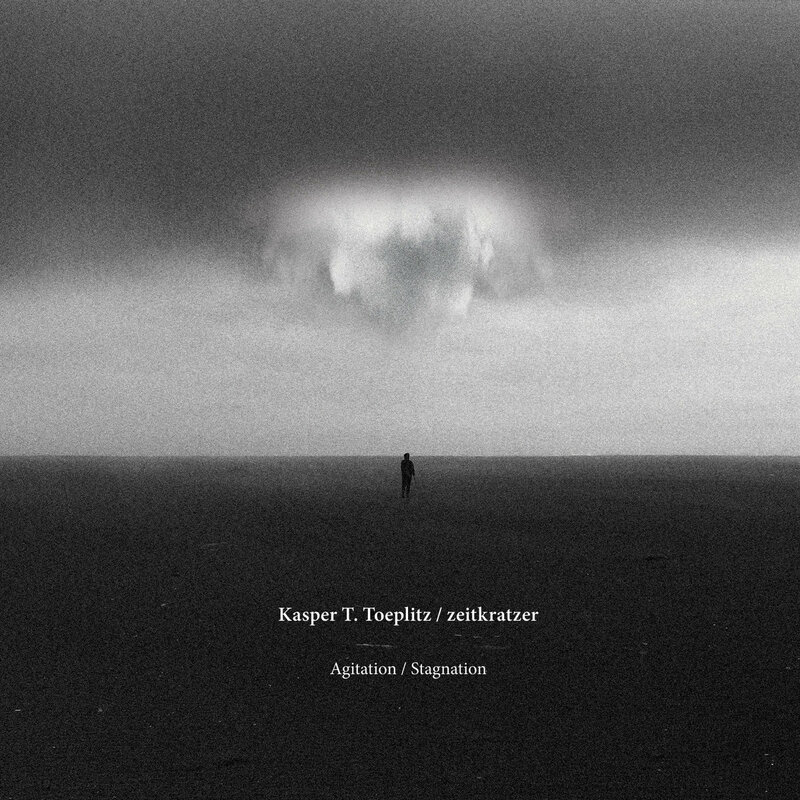 Kasper Toeplitz / zeitkratzer's double album "Agitation/Stagnation" released in cooperation with Bocian Records. One disc contains a recording of the concert with #SacrumProfanum 2016, the second electronic soundtrack. Though these works are intended to be heard separately, the two discs can also be played simultaneously. The origin of CRACKFINDER dates back to the concert of SONO GENERA  the trio of Anna Zaradny, Robert Piotrowicz and Jérôme Noetinger  at the Sacrum Profanum festival on October 7, 2016. That evening, the audience experienced a clear aesthetic breakthrough; something important was happening, something special. I instantly felt that the new thing that emerged could not be left unrecorded. Zaradny is a composer, instrumentalist and visual artist; Piotrowicz a composer, author of sound installations and virtuoso of analog synthesizers. They founded and curated the Musica Genera festival and label. Noetinger, an improviser, publisher and instrumentalist from Marseilles, specializes in electroacoustic collages full of permutations on his tape recorder and using all sorts of electronics. What connects these musicians are their methods of work: experiment as the basis of action, controlled accidents, repetition, processing and processuality. CRACKFINDER is intense and saturated, intriguing with fragments that are rhythmic yet distant from the repetitiveness of minimalism. They give a degree of structure to the otherwise loose amalgam of raw electroacoustics and instrumental improvisation at times evoking free jazz (when Zaradny reaches for the saxophone). At any time, however, the division of roles is clear, an impressive feat at such a high density of sound texture. 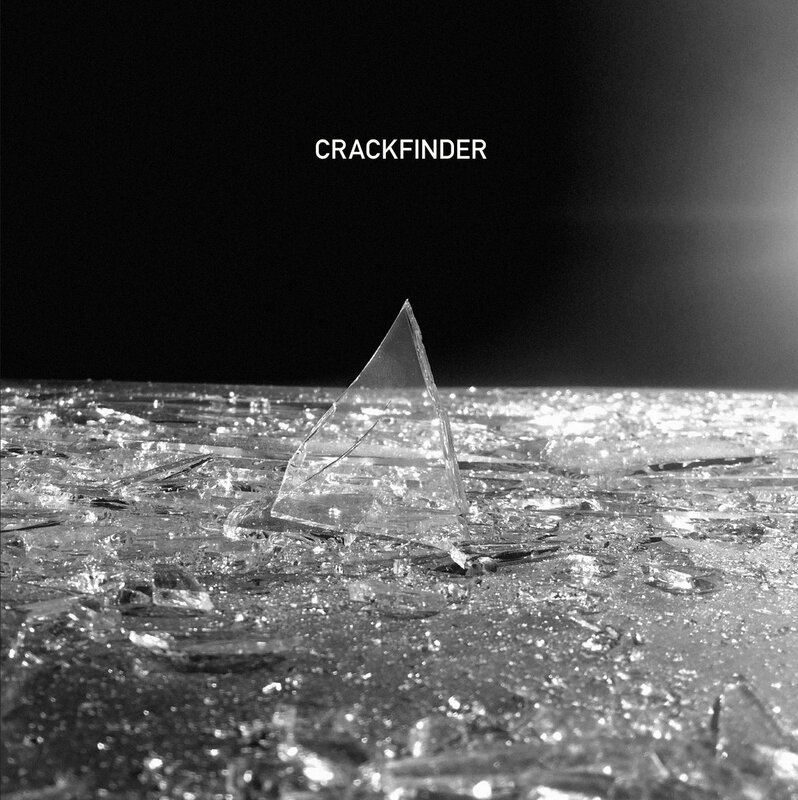 CRACKFINDER the album comprises of two distinct parts. The first is extremely intense and eventful, creating a strong tension, giving the sense of an immense effort or even wrestling between the musicians; a clash of ideas and values. This dialog is not monotonous but dynamic, full of changing and new hypotheses  as if in a process of reaching the truth. We can suppose that these investigated issues are philosophical and existential, giving the impression of greatness and overwhelming significance. The second part evokes a kind of a soothing stabilization. One may think that the interlocutors have reached a consensus. However, no-one is celebrating, and the mood is somewhat melancholic. The discovery proved to be depressing and the truth is not liberating  it becomes a burden. There is a poignant feeling of failure or unfulfilment, despite concluding and solving the task. Finally, we are left with silence, and even emptiness  with a symbolic and absolute dimension of the end. The effort of the first part, motivated by the conviction of the significance and need for proving something, is confronted with the disillusion brought by the end of the road. The effort, however, was not in vain  the discovery of the truth, although painful, can be purifying. The album offers more interpretative hints than just its expressive title. The artwork on the cover is a frame from the video art piece ENJOY THE SILENCE by Anna Zaradny: symbolic flares and cracking of matter in complete silence. The intensity of the image, however, creates a strong suggestion of sound. The back of the sleeve is spread with photos of the musicians holding the #BLACKPROTEST banner, in remembrance of the wave of pro-choice protests in Poland in 2016. Cracks  both material and metaphorical  do not have to be the negative effect of an abrupt event. They can be the beginning of change, an opening for the new, an impulse for action. It is, therefore, worth continuing the search for the 'portals of change'. We started from playing through Górecki’s original score, and then we decided to play a game based on a certain concept. We imagined that we landed on an alien planet and tried to play Lerchenmusik without access to notes and recordings. We wanted to find an answer to the question – what is really important to us in this composition? On the third day we didn’t think about the original score anymore, but we tried to recreate what we played during the rehearsals a day before. Conceptually, it wasn’t much different from a game of Chinese whispers. 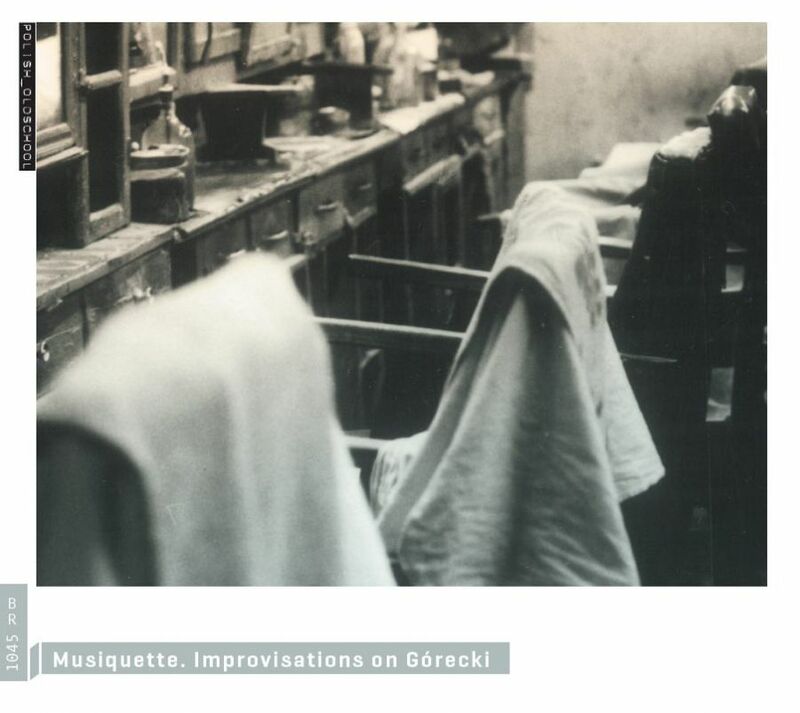 From the very beginning I believed that Górecki’s works had a huge improvisational potential, although at the same time they are perfect, defined entireties and there is no contradiction there. Modern societies attach great importance to defining roles and setting clear boundaries. However, throughout history, musicians from all over the world have based their work on the achievements and work of their predecessors, either directly or covertly, with or without their express knowledge and consent. Even a typical classical interpretation of the score is a manifestation, or at least a remnant of this practice. Let’s look at Perotin’s tropes, Liszt’s work, Stravinsky’s Pulcinella, and Berio’s Sinfonia. Agata Zubel’s works are performed by Klangforum Wien led by Clement Power, accompanied by the composer performing vocal parts. The work features compositions based on the poetry of Wisława Szymborska (Labyrinth), Czesław Miłosz (Aphorisms on Miłosz), Samuel Beckett (NOT I) and one instrumental piece (Shades on Ice). The album opens with Labyrinth (2011) for soprano (or mezzo-soprano), bass flute, trumpet, tenor saxophone (or bass clarinet) and double bass, with words by Wisława Szymborska (in the English version, the poem was superbly translated by Clare Cavanagh and Stanisław Barańczak). The piece was commissioned by the Polish Institute in Tel Aviv and was performed for the first time on 14 May 2012 in Jerusalem during the “Polish Connections” concert by the composer and Meitar Ensemble, led by Guy Feder. Aphorisms on Miłosz were commissioned by the Sacrum Profanum Festival to celebrate the year of Czesław Miłosz, which coincided with the anniversary of the poet’s 100th birthday. The lyrics used in the piece have been taken from Miłosz’s entire oeuvre – including both excerpts from his poems and prose. Aphorisms... feature a solo soprano, string quintet, drums, flute, clarinet, bass clarinet, trumpet and accordion. The world premiere of the work took place on 15 September 2011 at the Sacrum Profanum Festival, during a concert at the Museum of Urban Engineering. The solo part was performed by Agata Zubel herself, and the Klangforum Wien orchestra was led by Clement Power. Shades of Ice is a song written for an amplified clarinet, cello and electronics and the only song without vocals on the album released by KAIROS. The piece was commissioned by the London Sinfonietta Orchestra as part of the “Sonic Exploration” series. It was presented for the first time on 20 October 2011 in London, performed by Mark van de Wiel and Tim Gill. This is a musical representation of the composer’s fascination with Iceland’s landscape, in particular the Vatnajökull Glacier – Europe’s largest glacier. “It’s the most ‘imaginative’ piece that I’ve ever composed,” says Agata Zubel. 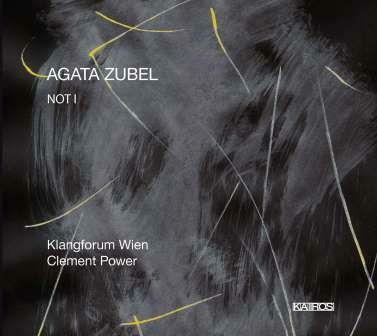 The album closes with the eponymous composition NOT I for voice, instrumental ensemble and electronics, written by Agata Zubel in 2010. The composition has won numerous awards, including at the UNESCO Composer’s Rostrum in Prague, it also received the first Polonica Nova Award in history. “I believe that awards are neither helpful nor detrimental to me in any way. Although receiving them is very nice because it reminds me that what we do resonates with people in some way,” the composer said about her successes. Unique music album released by the National Audiovisual Institute. 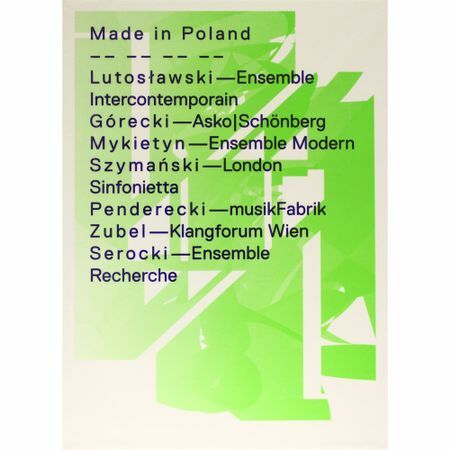 The works of seven outstanding Polish contemporary music composers performed by the world’s best music ensembles. Composers featured in the “Made in Poland” series of concerts organised as part of the Sacrum Profanum Festival in September 2010, in order of birth years – Witold Lutosławski (1913-1994), Kazimierz Serocki (1922-1981), Krzysztof Penderecki (1933), Henryk Mikołaj Górecki (1933-2010), Paweł Szymański (1954), Paweł Mykietyn (1971) and Agata Zubel (1978). Works, by date of creation: Penderecki’s String Quartet No. 1 (1960), Serocki’s Phantasmagoria (1971), Lutosławski’s Chain I (1983), Szymański’s Appendix (1983), Górecki’s Małe Requiem dla pewnej polki (1993), Mykietyn’s 3 for 13 (1994), Zubel’s Cascando (2007). Three DVDs: HD, Blu-Ray, 3D with an audiovisual recording of seven extraordinary concerts, recorded during the Sacrum Profanum Festival in 2010.